Wasps. Buzzing around your house, in your garden and sometimes even in your face, they're a nuisance. It's natural to want to get rid of them -- but you also want to ensure your dog's not at risk if you use an insecticide. 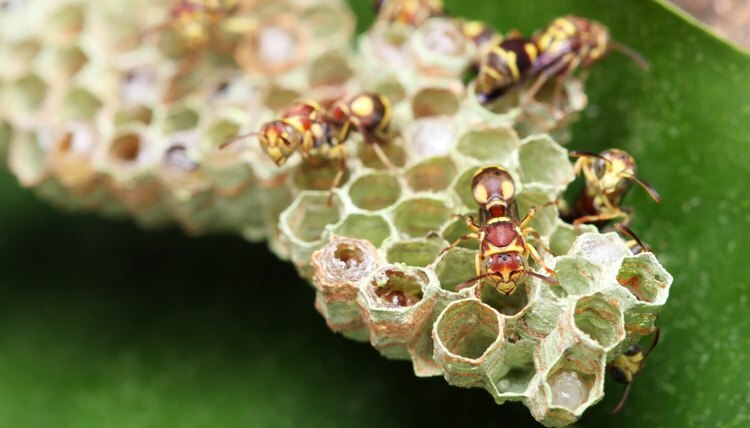 The active ingredients in most wasp sprays are pyrethrins, which penetrate wasps' nervous systems to kill them. If your dog gets into your wasp spray, he can get sick, possibly even experiencing seizures, depending on his sensitivity. Wasp sprays and many other insecticides use pyrethrins or synthetic equivalents as their active ingredients. Pyrethrins are also the active ingredients in many flea control products for dogs. Generally, it's safe for a dog to be in an area that's been treated with wasp spray, just as most dogs are fine using anti-parasite medications with pyrethrins. PetEducation.com notes that, though it's rare, pyrethrin and pyrethroid toxicity can occur if your dog is sensitive to this naturally occurring substance. It's possible but rare that a dog could experience seizures from wasp spray. A dog may ingest, inhale or absorb the insecticide through his skin, foot pads or eyes. Besides seizures, symptoms of pyrethrin or pyrethroid toxicity include excessive drooling, vomiting, agitation, weakness, tremors and difficulty breathing. Call your vet if your dog exhibits evidence that he's having an adverse reaction to wasp spray. If your dog has an adverse reaction to flea medication in the past, keep him away from areas where you use wasp spray and similar pesticides as an extra precaution.